It was released sometime around 2007. The state of Kedah exudes rustic charm and is characterised by vast paddy plains. It also lays claim to Bujang Valley, once the cradle of ancient civilisation and offers a captivating variety of natural attractions such as the famous island getaway of Langkawi, Pulau Payar Marine Park and Lake Pedu. Explore Alor Star, the capital city, and visit its historic mosque, buzzing market and stately museums. A microcosm ot its multiracial populace, it is blessed with diverse cultures which are evident in its traditions, architecture and litestyle of its people. 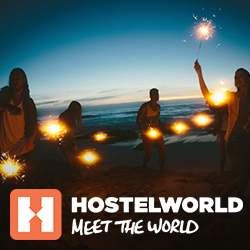 Travellers to the state can select their accommodation trom among various well-appointed hotels, five-star resorts and budget inns located in the city, towns and islands. Pekas Rabu This bustling bazaar offers a smorgasbord of northern delicacies and produce, handicrafts, trinkets as well as garments. State Museum Built in 1936, this majestic building incorporates local architecture with hints of Thai influence. 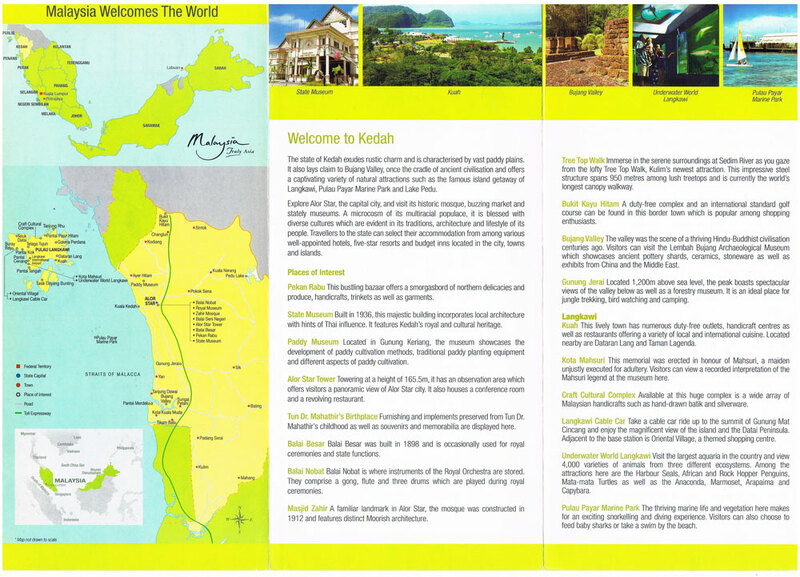 It features Kedah‘s royal and cultural heritage. Paddy Museum Located in Gunung Keriang, the museum showcases the development of paddy cultivation methods, traditional paddy planting equipment and different aspects of paddy cultivation. Alor Star Tower Towering at a height of 165.5m, lt has an observation area which offers visitors a panoramic view ot Alor Star city. lt also houses a conterence room and a revolving restaurant. Tun Dr. Mahathir‘s Birthplace Furnishing and implements preserved from Tun Dr Mahathir‘s childhood as well as souvenirs and memorabilia are displayed here. Balai Basar Balai Besar mas built in 1898 and is occasionally used for royal ceremonies and state functions. Balai Nobat Balai Nobat is where instruments ot the Royal Orchestra are stored. They comprise a gong, flute and three drums mhich are played during royal ceremonies. Masjid Zahir A familiar landmark in Alor Star, the mosque was constructed in 1912 and features distinct Moorish architecture. Tree Top Walk Immerse in the serene surroundings at Sedim River as you gaze from the lofty Tree Top Walk, Kulim‘s newest attraction. This impressive steel structure spans 950 metres among lush treetops and is currently the world‘s longest canopy walkway. Bukit Kayu Hitam A duty-free complex and an international standard golf course can be found in this border town which is popular among shopping enthusiasts. Bujang Valley The valley was the scene of a thriving Hindu-Buddhist civilisation centuries ago. Visitors can visit the Lembah Bujang Archaeological Museum which showcases ancient pottery shards, ceramics, stoneware as well as exhibits from China and the Middle East. Gunung Jerai Located 1‚200m above sea level, the peak boasts spectacular views of the valley below as well as a forestry museum. lt is an ideal place for jungle trekking, bird watching and Camping. Kuah This lively town has numerous duty-free outlets, handicraft centres as well as restaurants offering a variety of local and international cuisine. Located nearby are Dataran Lang and Taman Lagenda. Kota Mahsuri This memorial was ereCted in honour of Mahsuri, a maiden unjustly executed for adultery. Visitors can view a recorded interpretation of the Mahsuri legend at the museum here. Craft Cultural Complex Available at this huge complex is a wide array of Malaysian handicratts such as hand-drawn batik and silverware. Langkawi Cable Car Take a cable car ride up to the summit of Gunung Mat Cincang and enjoy the magnificent view of the island and the Datai Peninsula. Adjacent to the base station is Oriental Village, a themed shopping centre. Underwater World Langkawi Visit the largest aquaria in the country and view 4,000 varieties of animals from three different ecosystems. Among the attractions here are the Harbour Seals, African and Rock Hopper Penguins, Mata-mata Turtles as well as the Anaconda, Marmoset, Arapaima and Capybara. Pulau Payar Marine Park The thriving marine life and Vegetation here makes for an exciting snorkelling and diVing experience. Visitors can also choose to feed baby sharks or take a swim by the beach. Sungai Kilim Embark on an exciting boat cruise through mangrove forests to Kilim Nature Park and feel the thrill of the eagie feeding experience. Tasik Dayang Bunting Soak up the tranquil atmosphere at the Lake of the Pregnant Maiden, the largest freshwater lake in Langkawi. Galeria Perdana The gallery exhibits an assortment of more than 2,500 state gifts and awards presented to Tun Dr. Mahathir, the former Prime Minister of Malaysia. Pantai Cenang, Kok, Tengah, Datai and Burau Bay These beautiful beaches cater for sun-worshippers, beach combers and even adrenaline junkies as they can choose from several watersports available. Marinas Sailing enthusiasts will love Langkawi as it has excellent sailing infrastructure at marinas such as the Royal Langkawi Yacht Club, Rebak Marina Resort, Telaga Harbour Park and Awana Porto Malai Langkawi. 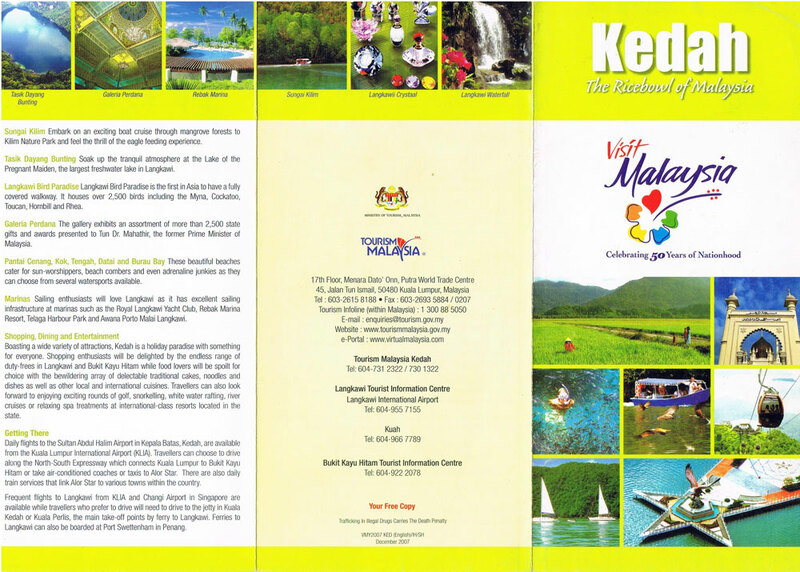 Boasting a wide variety of attractions, Kedah is a holiday paradise with something for everyone. Shopping enthusiasts will be delighted by the endless range of duty-frees in Langkawi and Bukit Kayu Hitam while food lovers will be spoilt for choice with the bewildering array of delectable traditional cakes, noodles and dishes as well as other local and international cuisines. Travellers can also look forward to enjoying exciting rounds of golf, snorkeiiing, white water rafting, river cruises or relaxing spa treatments at international-dass resorts located in the state. Hitam or take air-conditioned coaches or taxis to Alor Star. There are also daily train services that link Alor Star to various towns within the country. Frequent flights to Langkawi from KLIA and Changi Airport in Singapore are available while travellers who prefer to drive will need to drive to the jetty in Kuala Kedah or Kuala Perhs, the main take-off points by ferry to Langkawi. Ferries to Langkawi can also be boarded at Port Swettenham in Penang.